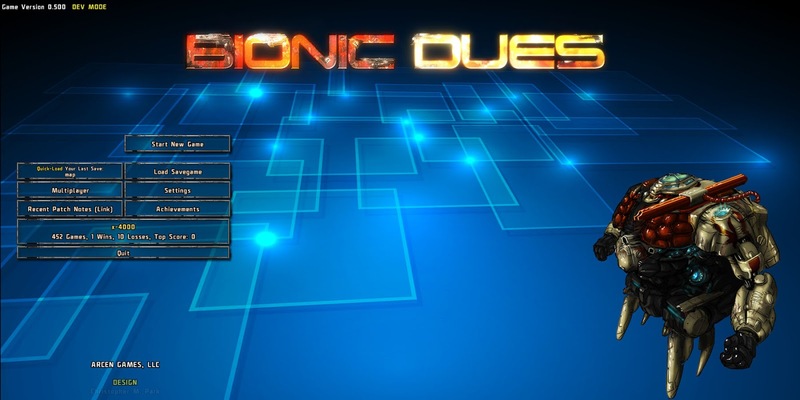 In my last post about Bionic, which was actually earlier today, I said that I would soon be posting some actual in-game screenshots of Bionic Dues. I bet you didn't think it would be this soon! Anyway, I'm really excited to share these with you. 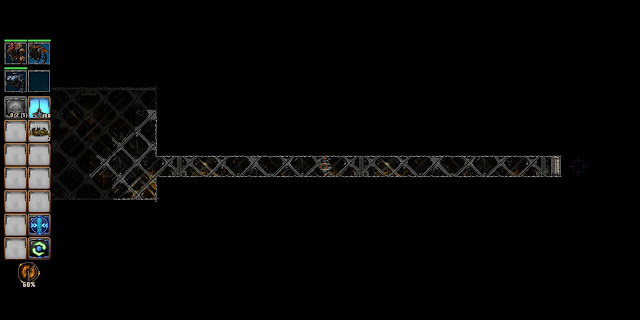 Click for the full-size versions of all of these, and bear in mind that these are jpegs so there is a little bit of lossiness to the images (but not much). Above: The title menu. It's pretty much what you will see in the final 1.0 version of the game, I think. The exo portrait on the right is different every time you start the game (out of the pool of 6 epic exos). Above: The "start new game" window. This is definitely final in terms of what you will see for the 1.0 version of the game. You choose your city map type, your team of four Exos, your commander, your difficulty, and if multiplayer is enabled or not. And you're off to the races! 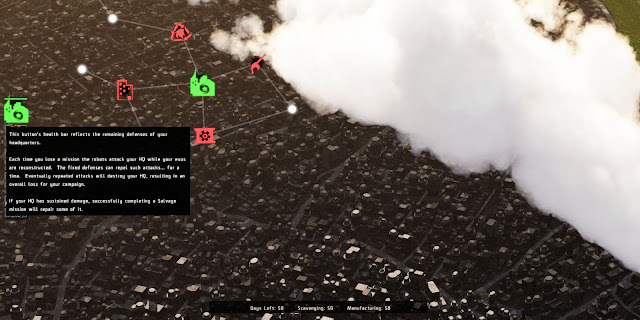 - The city map type gives you a different visual, as well as different node positions and connections. In even a single city, however, the placement of all the nodes is completely random, as is where you start in the city. - Your team of four exos really determines the feel of your entire game. If you choose four Science exos... well, that's going to be a really tough game! That's like the "four white mages" run in Final Fantasy 1, I'd say. But going without any science guy at all is also probably not the best plan. One tank, one science, and two of anything else is usually wisest. 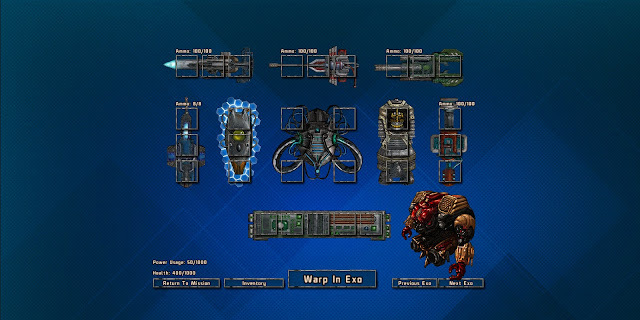 - Your commander gives you some sort of large single bonus throughout the game (and that's all they do, to be clear). In this case, Meg is selected, and she gets 50% better loot than usual, as she was formerly a mechanic. There are six commanders, and they all have abilities that are hard to choose between because they are all so desirable. 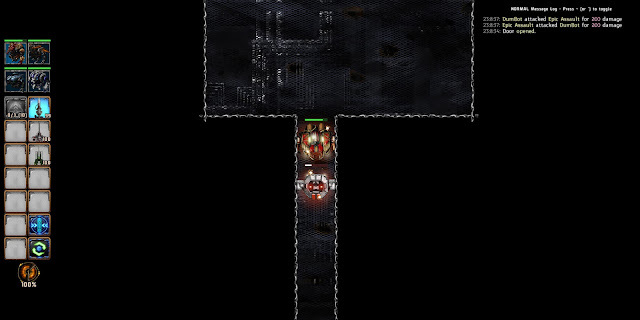 - The difficulty level determines three things: 1) how much health your home command has before it blows up and you lose the game (ie, how many missions you can fail); 2) the starting amount of and rate of growth of enemy robot manufacturing (higher is bad); 3) the starting amount of and rate of growth of your scavenging prowess (higher is good). 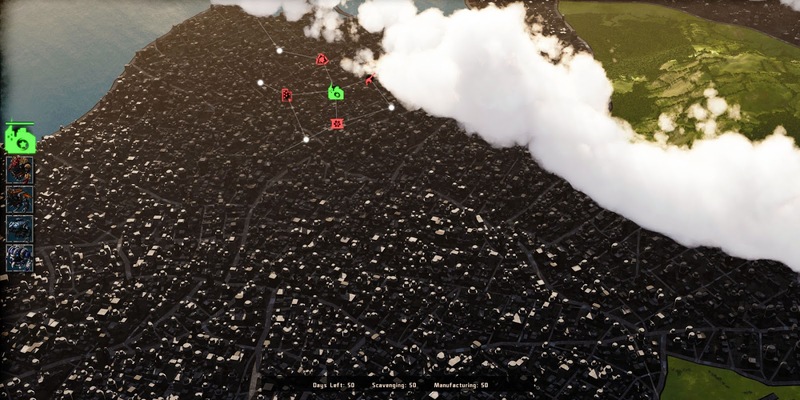 Above: Both the city map and the mission map can be zoomed in and out to a huge degree. Here we are all the way zoomed out, and we can see most of the city in one view. That said, we've only just started this game, so very few of the nodes are visible at all (just 5 out of 125 are visible, and then a further four are noted as "potential missions" that you will uncover if you complete a mission adjacent to them). Above: And here we are now completely zoomed in. Also I hovered over the home command health indicator so you can read that tooltip if you want. Above:"DumBots" are the basic foot soldiers of the game, and they have, shall we say, "Storm Trooper Aim." They always miss their first shot, and their shots don't hit for much anyhow. But the thing is, unlike in the movies, when you walk into a room full of 20 of these, you are actually in pretty decent peril. You'll want to draw them out for single combat if you can. If only there were a way to attract their attention without going into their direct sight range! Above: Further down the same hall from above, we find a BlunderBot. These guys have rocket launchers, which this one just used to destroy my Epic Assault Exo. This is the second robot I've met this mission, incidentally, and I was stupid in how I approached him and so am down an Exo already. BlunderBot: A Siege bot that often gets a bit distracted. This is at least as bad as it sounds. Above: Different mission, same city. This time I lost my Science bot, mainly because I was stupid and did not pay attention. So I'm using my Siege Exo at the moment. You'll notice that he isn't lit (and also not animated) yet, unlike the other Exos. That bit is still a work in progress. You can also see the fog of war as well as the sensor range. There are four levels of perception: never-seen-before, seen-but-in-fog-of-war, in-sensor-range (lit up and visible), and line-of-sight (can shoot at and be shot by). You'll notice that the sensor range extends in a "flood fill" style behind me, rather than being a Cartesian area. You'll also notice that most types of doors (glass doors and automatic doors excepted) block sensors. There is also the purple crosshair thing in both this image and the one below -- that's marking where the boundary between the never-seen-before areas of the map and any other status. That way it's super clear where to go (and those crosshairs are actually nicely animated color-wise in the game). Above: Third mission, same city. Everyone is alive! I haven't done anything stupid here. In fact, since these are just DumBots, I'm using my Science Exo to whistle and draw them out for easy smashing. 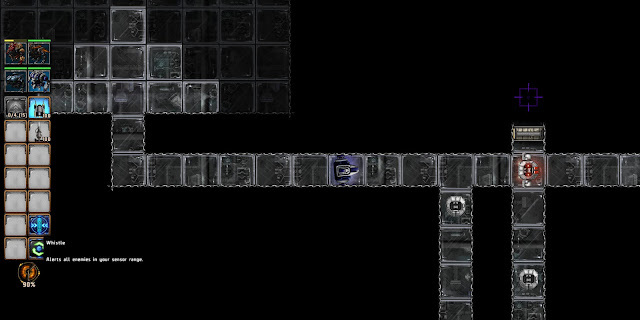 If I were just a little smarter and stayed back two tiles, I could do this without taking any damage. But whistling here is a good move at least. If I kill the top guy (who is alerted already) first, then back up and then whistle, then I can probably still come out of this with no damage taken. Above: The three major components of this game are the city view (where you make your long-range decisions by choosing which missions to undertake), the mission view (where the direct gameplay is undertaken), and this -- the Exo customization view. You'll spend a goodly bit of time here. 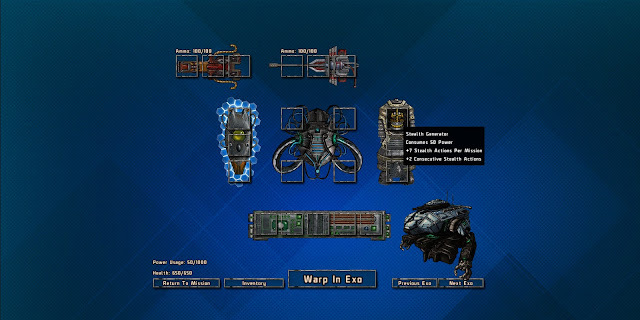 Above: On the prior image we were looking at a Tank Exo, and you can see how its slots vary from the Epic Assault Exo (this is the upgraded version of the regular Assault Exo; there is an Epic version of every Exo type). The Epic versions usually have more guns and other customization slots. In the center area you have the shields (left), reactor (center), propulsion (right), and then the computer (below). Normally the number of slots on those would vary by the type of Exo, but that isn't being coded until tomorrow. Oh man! Even more exciting! And that Exo customization view? That gives me a warm, fuzzy Mechwarrior load-out vibe. Maybe you said this already, but how is the ranged combat targeting handled? Mouse clicks? Wasd for movement, mouse for actions. And, now to pepper you with more questions! Any tab targeting for those of us with netbooks? Are there actions that target empty space? Like an AoE rocket into a corner, or grenades around a corner, or missiles attacking the darkness? The screenshot that says "wait a moment and let the dastardly foe fall into your trap." Does this reference letting them moving into range so you can attack first? "So why'd you have to cast magic missile?" I caught that reference. Tab targeting is not there now, and I'm not sure it will be. In general this game can't really be played without a mouse. Too many menus, hovers, things to click other than enemies, etc. I don't think it would work out, honestly; it's not like the valley games or shattered haven. I'm terms of aoe damage, yes that is there and yes you can fire it against the ground. The BlunderBot actually did just hit me with one. 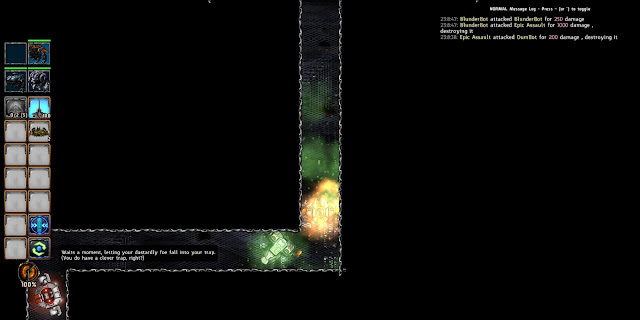 In that screenshot I was hovered over the wait button, which is pretty traditional for roguelikes. Whistle is pretty unique to my knowledge, but wait is a genre staple. It is generally useful when you want to let them round a corner so you can blast them. I don't think whistling is a mechanic in most rogue-like roguelikes, but I think you can deliberately make sound with nearby supplies. Throw a rock, throw a corpse you're carrying, stuff like that. Then again, those kinds of roguelikes are more tactical out of battle, rather than relying on smart moves in battle. Oooh, interesting stuff. I was expecting it to be something "outdoors" rather than dungeon-crawly, but I'm not complaining. Only thing that bothers me is the customization UI, with its large areas of empty space with nothing but a plain background (probably looks better in non-widescreen). The original XCOM had thematic backgrounds for UI screens, e.g. as a drawing of a hangar in the aircraft customization screen; are you planning on something similar? This looks pretty darn good to me. I generally love roguelikes of most any type, even if they are likely to get very long strings of four-letter words out of me. I doubt I even have to say so at this point, but you can consider me as a guaranteed pre-order as well as an applicant for the alpha as soon as that starts. Everything I've read about the game so far sounds pretty good. I'd ask a pile of questions here but I'm stuck typing on the iPad at the moment and the damn touchscreen typing drives me crazy. The visuals on that screen are considered to be pretty close to final, the small text aside. It's channeling historic games like Final Fantasy, not games like XCOM (the former of which I have a lot of fondness for, the latter of which I've never played so can't speak to). The large amount of empty space is due to different monitor sizes: we have to fit our UI in the smallest possible space that will work for 1024x720 resolution, the smallest horizontal and vertical sizes we support. So everything packs into there, and anything beyond that is just emptiness of some sort or another. I thought the attractive pattern was a lot better than being literally black and empty, you know? And again it channels FF. Wait, which thing are we talking about here? Right below the customization UI you mention getting bothered by it after getting a warm fuzzy. Are folks meaning two different screens? Awesome, we will hit you up in just a few weeks I think. Probably those two want to be in the alpha would get an invitation in around two weeks, thereabouts. Public beta might start two weeks after that. This is one of those games where it is kind of all or nothing: either it is done or close, or it can't really be played with too much enjoyment. At this point it's pretty close to done, all things considered. Still tons of balance and content work to do, but most of the screens (all that you are looking at) are pretty much final except for some flavor stuff. Nevermind. I meant to say I really like the overall look and style of the customization UI, but also that a background that has a little more flavor would be an improvement - I got warm and fuzzy due to the boxes and layout, not due to the background . But again - nevermind. All is well. Looking forward to play this baby ! Okay, well, perhaps we can do something along the sides, in this sort of space. I'll see what we can work up there. A lot of people will have that horizontal empty space and it will look kind of odd, so, yeah. Thought son the attached? This is a less busy mockup. Nice ! I like them both, although I like the first one better .